A United Studios of Self Defense school offering professional self defense & martial arts instruction in Palos Verdes, CA. Whether you are young or old, male or female, our most earnest mission is for you to reach and maintain your peak fitness level; both physically and mentally. 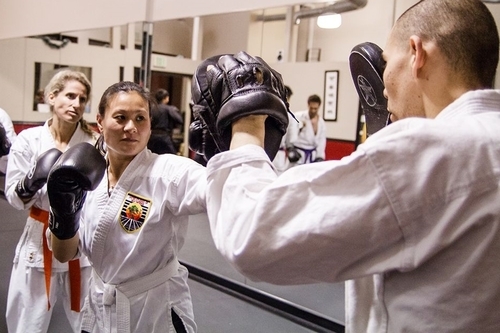 As a USSD school, the largest martial arts school in North America, Palos Verdes Karate offers a fun, safe environment for you to reach your potential. Thank you! An instructor will be in touch shortly to tell you more about Palos Verdes Karate. and 1 private lesson. All for only $20! Thank you! You'll receive an email shortly confirming your spot in the class. You are never too old to start Martial Arts. In fact, we find that starting Martial Arts long after childhood does not diminish, at all, your chances to benefit from them just the same. If anything, you will benefit more from our training programs than your child. You will become more flexible, stronger, more accurate and aware of your surroundings, all while finding peace within you. The Martial Arts, besides giving you an excellent work out, and teaching you practical Self Defense techniques, have been proven to be a fantastic outlet for adults to let their frustrations out or relieve stress, in a safe and fun environment, and also better their health greatly. If you are a student, adult, or professional, this program is for you. Conveniently scheduled right after school, this program gives your flying tigers an opportunity to get their energy levels up, their bodies on the move and get them ready to learn some safe and fun karate and kung fu. Throughout the class we encourage and get them enthusiastic about going though the exercises and stretches that will keep their bodies healthy and in shape for many years to come. Along with physical training we always incorporate the principles behind the martial arts that we teach. At home at school and wherever they may be, you as a parent, can be sure that the lessons and principles they learn here in the studio such as respect, sincerity, self-control and effort just to name a few, will soon be put in to practice in their daily lives. Little by little your young flying tigers will and grow to become teenagers with character that are happy, healthy and with enough confidence and self-esteem to take on any task that their future might hold. This martial arts program is specifically designed for your young children. The Little Dragons will learn the basics of martial arts: punches, kicks, blocks, and stances in a safe environment, all while developing their focus, confidence, self-esteem and respect for others. We have many incentives for the children to perform better, both inside the dojo and outside of the martial arts. Our friendly and professional staff will always ensure that your child is practicing martial arts safely while having lots of fun in the process. We also work directly with you, the parents to customize the training program to give all the benefits your child needs. Over time, this program will prove to be the best investment you could make in your child’s future. There is no time like the present and the journey of 1000 miles begins with the first step. Take that first step below. We'll walk you through some martial arts basics to get you comfortable. Then help you figure out which classes are right for you. You'll get a Karate uniform, a month's worth of group lessons, and 4 private lessons.